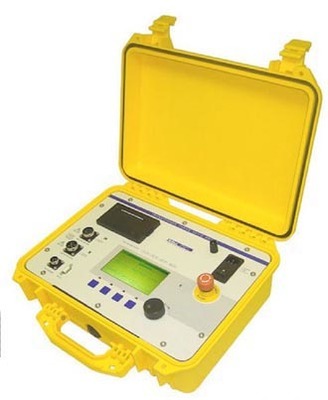 The Instrument os one of the best transformer turns ratio tester and have been used in many machines. The test voltage that can be measured through the instrument is to 40Vac that is @0.6A and 4Vac that is @1.0A. The polarity reading that instrument that can go through is out phase and in phase indicators. The current reading range starts with 0-2 Amperes and the accuracy measured is also ranging up to 2% of the readings. A computer interface that is used in developing is RS-232C. The instrument can measure approximately 22 records in subsequent 33 readings through. The device comes with a warranty of one year and the labour too, it can be exchanged till one year if any of the parts need to be changed it can be taken to the nearest service center. 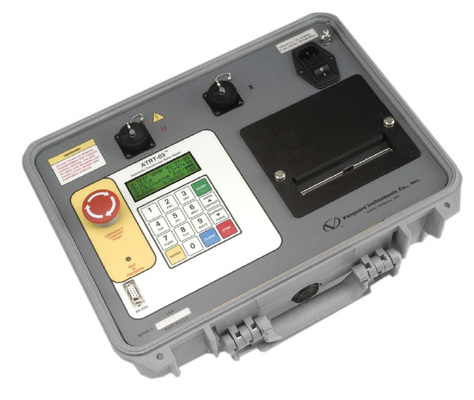 The devices come with a transportation case, that can hold the cables and units if in any case, you need to transfer the transformer from one place to another. The Altitude that can be measured by the transformer is up to 2000m and ranges for the full safety for the people working with. The device comes with these much-tuned specifications. It is also used in calculating the various turns and in this field it is specific to percentage error. The screen of the transformer is used to display excitation current so that the same can be recorded in the books. It also displays the respective phase angles and winding polarity for the testing purposes. These are some of the specifications that the respective transformer caters too. It has been recorded and seen that the transformer have been very famous from years and have been known to deliver the required results quite a long time. The transformer are always known for the accuracy of results they deliver and the transformer in discussion have been said to do the exactly for what it is made up of. So, if in the future you are looking for any device for automatic processors and for turning ratio testers then do take care of this one as one of the great options for you. 1. 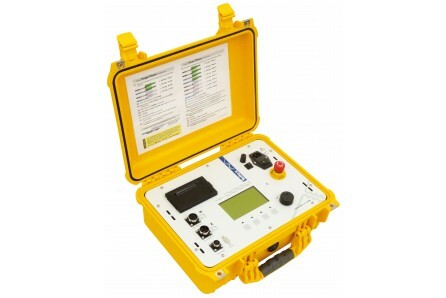 The instrument is light weighted and a portable device it supports the three-phase measuring through ratio meter. 2. The ratio that is measured through the device ranges from 0.8-15,000) i.e. 5-digit resolution). 3. No, an adjustment is required if we talk about the installation of the device in the premises. 4. The test voltage that can be measured by the device is 40Vac, through @0.6 amp, 100 Vac through 0.1 amp and 8 Vac through 1 amp. These three types of test voltages are one of their kinds as no other device in the industry is said to provide such higher test voltages through them. 5. The device is said to come with an LCD screen that is used to display approx 20 characters in 4 lines, and the most important part is that the screen can be viewed in bright sunlight and also at very low levels too. The screen can be used for various purposes while at work and this is an added advantage with the device. 6. The device comes with a year of warranty and for labor too if any part of the device got damaged or is not working properly you can change the same then and there and can start using your device again in full swing. After one year you can also speak the company to extend the warranty period, if possible. 7. The device is attached to a printer for taking the printouts at times, the built-in the printer is approximately 4.5 inches wide and is thermal in nature. 8. The device comes with a computer interface that is RS-232C in nature. 9. If we talk about the internal memory then we will see the device have the same as well. It can store up to 128 test plans of a respective transformer. 10. The device comes with the case of a transformer for carrying the same from one place to another and the tap-changer as well as a remote control processor. These are some of the features of the device that makes the same unique in the respective industry, it has been seen that these kinds of devices are very rare to make as the same has very unique features. Tettex TTR2796 a three phase transformer turns ratio meter is a fully automatic meter that can is used to measure the turn’s ratio, phase displacements, voltage ratios and excitation current. They are used to measure the current with the highest frequencies that were ever noticed by any equipment in the industry and that is here they are with the 0.3%. If we consider various measures for the preventive measurement then this equipment scores on a higher side than any in the same league. They support a very high voltage of 250 V and that is why they seem to have experienced with better transformer excitation. These transformers can be procured from the market at any time. Let's discuss their features:. 1. The equipment is a fully automatic and is used in measuring the various different currents. 2. The equipment has a built-in a printer to support and taking the printouts by quick test reports results and through the data loss that can be prevented. 3. The equipment can be used to measure 50,000 ratios at any time. 4. The equipment is light weighted, rugged, compact in its design and can be used in very harsh and in adverse conditions. The closed case of the equipment is IP65 waterproof and open case is also a kind of splash proof. This makes the equipment one of the best in the industry as you can use the same at your own ease. 5. The device can also use to control remotely through the software and through the laptop or any PC as well. And this facility can be used for data gathering and exchange and analyze. 6. The device consisted of a switch that is known as a tap changer which can enable the convenient testing through various multi-tap transformers. 7. The device is quite safe to use by the operators as it is equipped with the safety features as well. The device has the safety features and performs the setup test before going for the test voltage. This step is performed to guarantee the safety of the equipment and the operator. 8. Phase displacement of the transformers can be measured through various groups that are known as traction transformers, rectifiers and phase shifting. The equipment has been used to analyze the turns ratio from a long time and has been said to cater and master the technique in a short while. The equipment is equipped with everything you require to test the server. The equipment is the best in its field and has been recognized for many years to provide a quality service in the same industry. If you have a requirement then do cater to them as they are the best in their field and can give you the satisfaction like no other can provide. So, if you are serious about the testing from the turn ratio then do cater to them as one of your premium partners. We wish you luck for your future ENDEAVOURS!! The Tettex transformer is one of the best in their field they have been mastering the same from a long time and have made a promising delivery and future in the electronics world. The transformer has been one of the reliable devices so far in measuring the excitation current, phase displacements, voltage and turns ratio too. The voltage that can be selected for the calculation is V, 10V, 40V, and 100V. The accuracy of the device is about .03% for the various ratios ranging from 0.8 to 100. The device uses a kind of simple interface for various quick set ups. It has have been one of the famous devices in the industry which has been calculating the ratios with lots of accuracies. 1. The device has various color coding with the labeled test leads for the easy setups. It helps in quick setting up of the work and the user also find it quite interesting as compared to the others. 2. The device can be used with the remote control through the laptops and the software. 3. The users and operators can generate the quick reports from the built-in printers in the device. These reports through the printers are very useful for the people who are sitting on the other side of the table as you do not need to bother about printing or saving them on other devices. 4. The device has been transported as a rugged and compact case for the easy portability from one place to another. This makes the device to be sued and kept in various adverse as well as different climate conditions. 5. The device comes with the automatic winding configuration and various vector detection so that users can easily operate them. 6. It helps in the detection of faulty windings of a transformer as well as various defective tap changer configurations. 7. The device has been well known to provide all the measurements in a device in view so that the user doesn’t bother about anything while working. The users usually have the criteria of measuring different currents from different devices, but this device provides you the facility which no other can provide in a single go. 8. There are various measures to with whom you can measure the various position of the tap changer ratios in a go and the best part with them is they can be displayed graphically and a user can measure them. The device is made for the users and they can work with lots of ease with them, they have been one of their kind in measuring the turns ratio at various intervals and have been doing since from decades for the users. They have been one of the best options for the users and have been providing the customized solutions to them from a long time. If you are interested in taking your work to another level, then you are at the right platform these devices can guide you, towards the ladder and can provide you the results with utmost accuracy till date. So start using one of the best test measuring device. 1. The device is operated through a battery that can be charged for the repeated usage too. Once charged you can used the device for hours according to your usage. 2. The device is said to be suitable for various kinds of test that comprise of continuity and reverse polarity test too. These tests are very much usable in the industry as there are quite important in the test modes. 3. 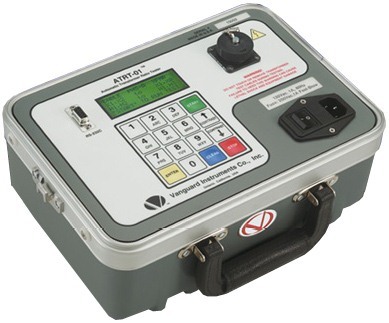 The Raytech TR-1can measure the current up to 1A for various CT testing. 4. It has the built-in printer too so that the test cases can be printer from time to time. It is said to support the TR-1P printer model. 5. The device has an internal storage so that it can store up to 50 test outcomes with them. 6. The device is fully automatic and also supports the continuous adapter for prolonged operations. 7. The computer interface that is supported by the device is an updated version that is RS-232. 9. The best feature is the device is that its comes with 5 years of warranty, this feature is not provided by any in the same industry. Users can sue the device in the full swing and can look forward to changing any part if something doesn’t work in an appropriate way. 10. While working with the device you can measure up to 1000 measurements if the device is fully charged. 11. The device also comes with the function of Pass and fail so that you do not seem to get in trouble if you can’t measure anything. The device is one of the kinds and has been used in the industry for the purposes of the measuring and has also proved its worth in the years of working. If you are looking forward to measuring the test cases then do not fear and you can make a purchase from any nearby shop or even through online websites as well. So, do not fear of anything if you are going with Raytech TR-1. Place your order and sit back as it will be one f the great things that you have bought till date. We wish you the life best always for your future ENDEAVOURS!!! 1. 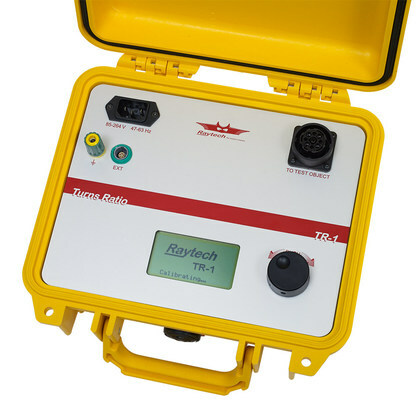 The Raytech TR-MARK II is used to calculate various measurements at times and been used to measure the test voltages that ranges from 40V, 100V,10V, 1V and then automatic. His features make the same as one of the best choices as no one in the industry is said to provide such kinds of features. 2. The device comes with the display of graphic tap changer, that can be of a great help for the people who are doing the same and providing the assistance as well. 3. For the emergency time, they have an option of shut off for the adverse timings. 4. The device is also equipped with the enhance protection that is a kind of heavy duty protection. 5. It also displays the various deviation from the normal ratio for the users to have an idea. 6. One of the best features of the device is it comes with the warranty of 5 years and the company is quite responsive for any change at that particular time. 7. The LCD screen of the device has a backlight so that it can be quite visible to you in the dim light as well. 8. The internal memory of the device also said to store at more than 13,000 various locations in the device and it clearly indicates that the device can store up to 1000 complete tests. 9. The device comes with the sealed front panel and is having Piezo-electric actuation for the usage too. The device is equipped with everything which a user requires to perform the testa as the best part is that they are doing their work too with the approximation. So, undoubtedly it can be the best choice for your work, as the same is coming with a huge warranty period it will help you in learning more of their kind and you can use well their services too in the warranty period. The test results you are receiving are coming with the utmost approximation so do not worry about the same as you are in the safe hands now with the Raytech TR-MARK II . Do have a good usage of the three-phase transformer so that you can do a good work in no time. 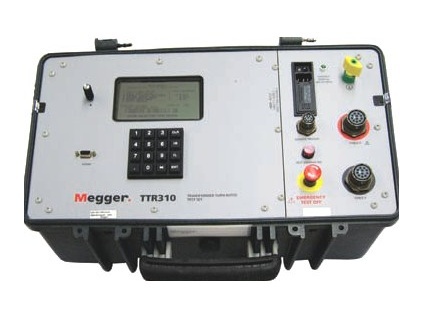 The TTR330 is one of the best three phase transformer test set that is available in the market. The device derives its uniqueness through the operation of the PowerDB Onboard software system through navigation keyboards and full QWERTY keypads. The device provides an interface to the users to interact with the software and one of the best parts of the device is that they display the result of the test on screen too. The devices come with the primary feature of having two USB ports and an Ethernet. The USB ports are there for connecting directly t the printer and for storing the data in a memory device which can be used later in analysis or printing. The Ethernet port allows the direct connection to the PC. 1. The device operates in a fully automatic manner with the various user interface through various test forms that are onscreen customizable. 2. Built in USB port allows the device to give the printout and does not require to connect to any PC too. 3. The device has a built-in capacity to store data in the form of XML sheet or format and can be stored in either internal memory or through any USB port can be transferred too. 4. The LCD screen of the device is an 8.4 VGA color display. This makes the work a lot of fun with this device as there is no other device that has a colored screen with them. 5. The device has a vast internal storage and can store up to 100,000 test results for the analysis or printouts can be taken for further research. 6. The device is said to weigh approx 11.8 kg and the keypad is said to have the navigation pushbuttons for the operator's usage and full QWERTY keyboard is used with the device. 7. Te device has the capacity of measuring highest ratio i.e. 45,000:1 and the highest accuracy of a 0.01%. 8. The device for best working requires the presence of high interference or high voltage. 9. One of the advanced features of the device is that device allows the user to customize the test forms through full-screen Power DB. The testing procedures and the various storing capabilities allow the operators to have an easy setup and to test the difficult three phase test in just the fractions of seconds which were quite difficult for the other TTRs. 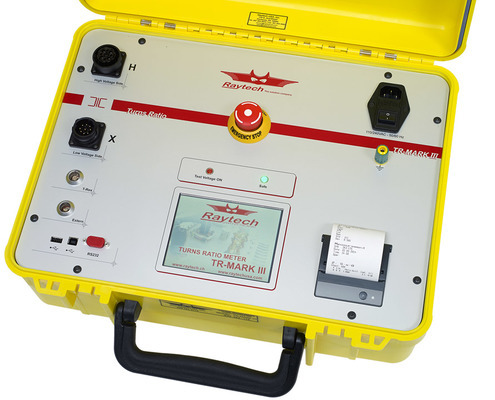 This TTR is best in storing and testing the data, this is one of the best among the TTR series and has been one of the maximum service providers for the operator too. The TTR 330 have been serving the clients from years and is said to provide the best results in these times. Being the light weighted the device have been recognized to a handy one and has been used in many power and distribution transformers. If you are looking forward to a reliable and advanced transformer then this is your device. 1. The device is fully automatic in nature that is through remote-control or stands alone. 2. The instrument is quite upgradable to a TTR320 or TTR330 without any compromise to any calibration. 3. The device has a built-in capacity of storing various test results into an internal memory, in a format of the open data format for the input of XML or Excel. 4. The device comes with the six types of languages and the device is configured for three kinds of excitation voltages of 8V, 40V, and 80V. 5. The device is quite user-friendly and comes with a menu is driven operations so that operators feel good while operating the device. 6. The device assist in measuring the various regular windings, CTs and tertiary windings too, this not only makes the operator happy but also makes the device as a solution for many issues. 7. The device is said to have a quick test mode for testing the data in a quick manner and also checks the polarity of the test in the starting. 8. The device saves up to 9 custom testing f the transformer for the easier and convenient testing. The device no only specializes in testing but can also store data of the tests so if you are looking forward to the device that can store and test the ratios too So your search ends here, as this device can provide you all the results in ago. These have been one of the kind in the industry like no other and can able to prove the best in the same domain as well. If your site require a solution that can be best and can be able to connect with various devices as well and in turn can test too. So, you can consider the respective option for yourself. 1. The device can operate as a standalone or through remote control application and operations. 2. The device has been found in the industry to measure the excitation current, phase deviations and off course the other ratios as well. 3. It only works in the presence of high voltage and high interference and it helps in giving the accurate test results. 4. The device is said to display the highest accuracy of approximately 0.1% and ratio measurement (1:45,000). 5. It is said to display the nameplate v/s %error with the respective fail/pass limits. 6. The device have a built in capacity of downloading and storing test results in XML format, a that too via USB ports or Ethernet. 7. To upgrade your device you do not need to compromise with the calibration too. 8. It has a rugged body and its robust design helps in its sustaining in the harsh environment too. It is suitable for the industries where the temperature is adverse and the test results need to be conducted with utmost accuracy. The series is said to measure the various phase deviations for the transformer that is said to have primary v/s secondary, this indicates that there can be discrepancies like core faults and partially shorted turns. The device can be used and have been proven to be quite helpful in all kinds of CTs and PTs. The units of devices come with various facilities for the single person like remote control switch. This allows the individuals or the users to have a check on various LTCs in q quick manner. This device is followed by a series and have three other units as well. 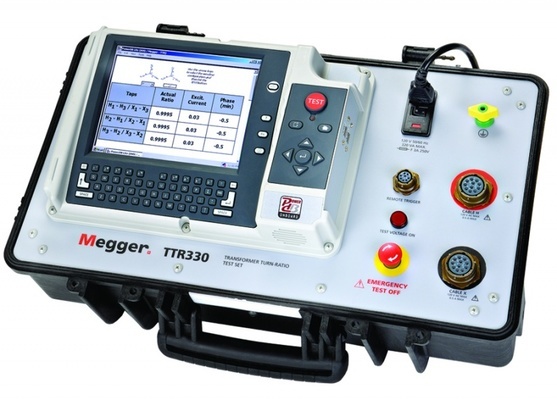 All these units ha been specialized for different works sand have e been upgraded from time t time so that there will be no discrepancy and the user will b eat its comfortable zone while relying on Megger TTR300 series. 1. The device is light weighted and comes in a handy case for the users. 2. The device is a battery powered one and has shut down and a power saver function attached which can be used at various times so that you can be at ease and can use these functions according to your work. 3. It can be used to measure the winding resistances, polarity, and the excitation current too. 4. It has internal memory which can be used to store up tp 200 test results and various other 100 user defined settings of a test. 5. The user from various countries can used the device to choose in six different languages. 6. The device comes with an alphanumeric keyboard and can be used through RS-232 computer interface for transferring the data and printing them for the user's perusal. 7. The highest measuring turns ratios efficiency found with the device is about 0.1%. 8. It also meets the entire IP54 requirement to go through. The device has been used to measuring the quality from a long time. Due to the frequency and the approximation of the work shown by the device it has been used in testing and QA sections across the industries. It has been seen that these kinds of products do change the work environment and add a spark to their work. They have been one of their kinds in taking the work to another level, as they have been through lots of hassles that need to be get involved with the results. If the test results come with accuracy, it adds a lot to the kitty of the people and performs the work with accuracy. The device has been also used to store lots of data with them, which is an added benefit, so do take care of these benefits with the device and have the same in your hands while you take a walk at your site.